Part of the banknotes seized after last month's robbery at the suspended Transport permanent secretary's home were found to be linked to certain private companies that won bidding for Transport Ministry projects, according to the national anti-graft agency. Klanarong Chantik, spokesman for the National Anti-Corruption Commission (NACC), told a press conference yesterday that the NACC subcommittee investigating to determine whether Suphoth Sablom was unusually wealthy had found the lead. The subcommittee had asked 42 banks in writing for information about Suphoth's accounts and 27 of them have replied, the NACC spokesman said. He added that the probe panel was looking into the details of the information provided by the banks. The panel examined 89 banknote bands that came with the Bt8 million (S$332,000) in cash confiscated from the robbery suspects. The money was from nine banks and it was found that the banknote bands from five banks contained information that linked them to certain private companies involved in bidding for Transport Ministry projects, according to the NACC spokesman. He said the investigation subcommittee would summon the private companies in question to testify about the findings, adding the panel was authorised to do so without first seeking approval from the NACC. He also said that the probe panel had assigned two teams of its investigators to gather more information regarding the matter. "The officials now have information about the source of some of the banknote bands, but I would not like to speak about this in detail," Klanarong said. He declined to specify in which project of the Transport Ministry the private companies in question were involved and whether it was the subway line construction project as had been alleged by Deputy Prime Minister Chalerm Yoobamrung, who is in charge of police affairs. "What I can say is that the money is linked to certain companies that won bidding to enter into an agreement with the Transport Ministry," the NACC spokesman said. He said the anti-graft agency's investigation so far has not found connections with any politician or affected any bidding or project of the Transport Ministry. "Initially this is investigation into allegedly unusual wealth, reporting false information about assets, and malfeasance. After this there will be an in-depth investigation," he said. The NACC summoned Suphoth to explain about his wealth before January 11, according to the spokesman. He said the agency has notified Suphoth in writing to testify about his wealth but that he had not done so yet. Klanarong said the NACC has reported to the Criminal Court about its findings in the recent search of Suphoth's spacious home in Bangkok's Lat Phrao area. Eight suspects have been arrested in connection with the heist on November 12. 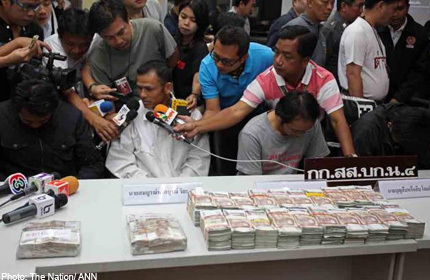 Police said they confiscated Bt18.1 million from the alleged robbers but Suphoth insisted that only Bt5 million were robbed from his home. Chalerm, of the ruling Pheu Thai Party, recently attempted to link Suphoth's money to former transport minister Sophon Saram from the rival Bhum Jai Thai Party, who quickly denied the allegation.